From my experience of working in the same company both in Switzerland and the United States, I’d like to outline 5 tips for doing business in Switzerland and what an American coming to Switzerland should keep in mind. Punctuality is one of the great virtues of Swiss culture; after all, we make the world’s most renowned watches. Maybe it’s not so much about the watches but more about precision (we’re also very precise with our chocolate). Showing up late, and in my view everything beyond 5 minutes can be considered late in Switzerland, is bad habit. This also applies to private life. Technical competence is an important value in Swiss business culture. Especially from managers it is expected to be one of the most adept people in their department. For meetings or presentations, being prepared for questions that might come up will demonstrate that proficiency and help you be credible among your Swiss colleagues or superiors. Also, meetings are usually followed according to an agenda, and flexibility to change path is low. Therefore, when planning a meeting, it is also important to show preparedness when sending out an invite, including pre-readers and agendas. Swiss don’t like to mix business with private. Work talk is thus not usually preceded by small talk, but people get ‘down to business’ quickly. (Although the weather usually is a safe bet.) Even a ‘how are you’ sounds insincere if you don’t know each other well. Becoming somebody’s ‘friend’ takes time; Swiss need to know they can trust you, but once they do, I believe that they’ll also go the extra mile for you. Swiss people generally dislike persons who behave as somebody important. Think of our ministers who you might encounter in a public bus or train reading the daily newspaper – nothing out of the ordinary. The Swiss don’t approve of ‘theatrical’ demeanor like it is the case, for instance, in Southern European or also, to a certain extent, American politics. The same goes for displaying wealth; I remember my parents telling me that people with ‘old money’ behaved in a nice way whereas the newly rich often behaved outrageously. I think in America, where money is relatively new, as compared to Europe, it is less of a problem displaying your status and getting rich or successful quickly is more of an aspiration than a problem (think of all the Silicon Valley entrepreneurs). That also ties in with being humble. Achievements are not so much displayed or talked about. That starts at school and continues throughout the professional career. It’s more powerful when people find out about somebody’s success than him broadcasting it. However, I observe that especially Germans are quite successful in the Swiss business environment and that one reason is that they talk ‘better’. I perceive Americans as very adept in language and I think they can use these skills to their advantage in Switzerland. It’s important, though, to find the right balance between being humble and selling yourself. Swiss often need convincing and time before agreeing to something. But when they do promise something, people try to follow through on their promises. I think this is a crucial point in doing business in Switzerland. It also applies to private life. In my experience it’s easy in the United States to agree with somebody to get a beer sometimes – I feel it doesn’t have to mean much. In Switzerland, however, agreeing to getting a beer implies to do so and probably make plans soon. I also think that this is a major point of frustration for Swiss people working in the United States. We probably mistake talk with intention; but a successful manager should understand those cultural differences. These differences have been studied a lot, for instance by Geert Hofstede. 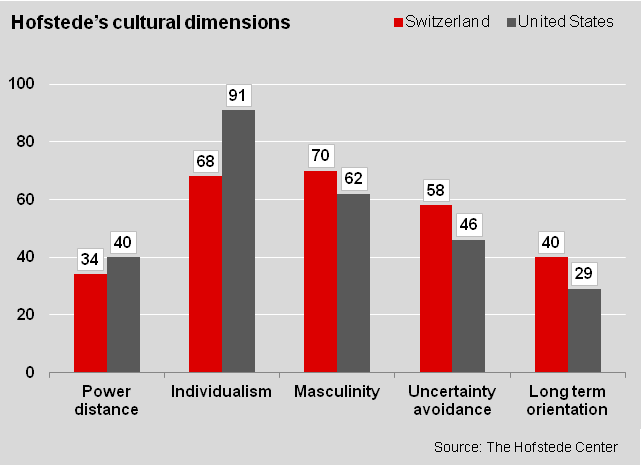 American society tends to be much more individualistic than the Swiss, but, at the same time, less long term oriented and more willing to accept uncertainty. That definitely comes from history; a vast land, less institutions to enforce law and regulate society, but also a lot of changes in a relatively short period of time. Switzerland, on the other hand, has had well-functioning institutions since a long time, but has not seen drastic changes in the last century. For anybody working in a different country, it’s most important to understand these differences, and often it is possible to take advantage of them (in a good way, of course). I hope these five tips will give you a head start for doing business in Switzerland. The best way to learn about a new culture is by listening and asking questions.